The World Cup is in the subcontinent and cricket fans are thronging the stadiums. Presenting a sneak peek at the colourful people cheering from the sidelines. There can't be a bigger sporting carnival in the sub-continent than the Cricket World Cup. And, making the most of it are the cricket-crazy fans who've swarmed the stadiums in numbers, making the marquee event a huge success already. There was evidence of the people's undying love for the game on the first day of the tournament itself. Hosts Bangladesh were taking on favourites India, and nobody wanted to miss the action. Fans came in numbers -- faces painted, flags in hand and other accessories adorned -- to back their team, but it was sweet revenge for India, who thrashed the Bangladesh team by a convincing 87-run margin in the Group B encounter. 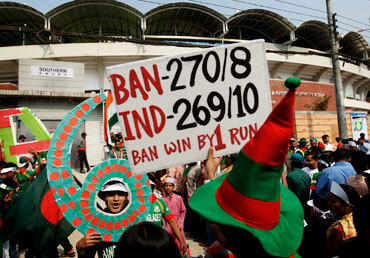 The Bangladesh supporters were optimism personified and expecting an encore from their team -- this picture says it all. They screamed themselves hoarse in support of their boys. However, all hopes were dashed by Indian opener Virender Sehwag. The hard-hitting batsman scored a blistering knock of 175 to help India steamroll Bangaladesh in the opening encounter of the World Cup. 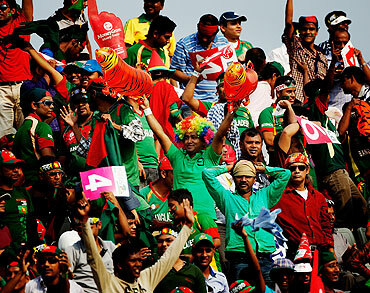 For Bangladeshi supporters, sporting events of such magnitude are rare. 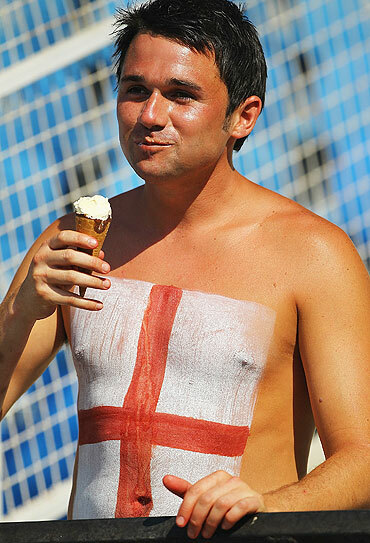 So, for the average fan, hosting a World Cup match is more than 'just another cricket match'. The fans soaked in the carnival-like atmostphere and smiled through the encounter, even as Sehwag went on a leather hunt, treating the Bangla bowlers with utter disdain. Chennai got the privilege to host the first match in this edition of the World Cup. And, what a match that was! 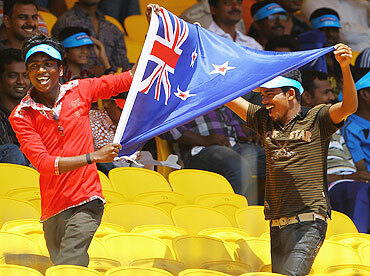 The Indian fans were wholeheartedly supporting New Zealand and all the support worked its magic on the Kiwis. A dominant performance from New Zealand's bowlers saw the Kenyan batting in tatters. Pacer Hamish Bennett was the wrecker-in-chief, running through the Kenyan batting line-up as the Africans folded for 69 in 23.5 overs. Then, it was a walk in the park for the New Zealand batsmen, as openers Martin Guptill and Brendon McCullum scored quick-fire knocks of 39 and 26 respectively to overhaul the target in just eight overs. 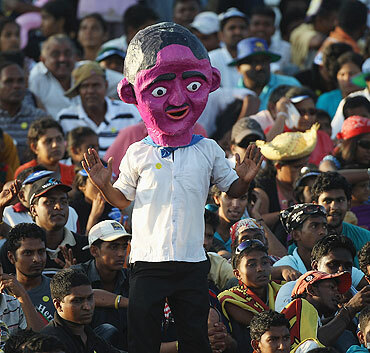 The quaint Sri Lankan town of Hambantota was hosting its first-ever international cricket match on Sunday and it turned out to be a truly memorable affair. 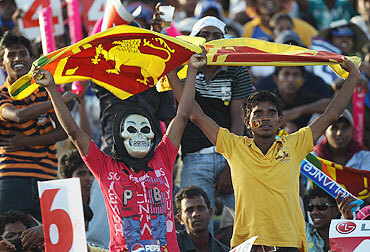 With the fans egging on the mighty Lankan lions -- face masks and all -- Sangakkara and his band of men did well to quell the Canadian challenge. The fans backed the Lankan boys to the hilt as Jayawardene slammed the fastest century by a Sri Lankan in the history of the World Cup to crush hapless Canada by 210 runs. With fans going ballistic in the stands, Jayawardene treated the audience to some sweet hitting. The former Lankan skipper also managed to please the crowds by smashing nine boundaries and a six. Andrew Strauss had warned his teammates and fans of the potential threat that the Netherlands' cricketers posed. And, how right was he? The Netherlands, bouyed by Ryan ten Doeschate's superb century, put the heat on the England bowlers and suppoters alike, as they posted a stiff target of 292 for six. The England batsmen stuttered in the beginning but went on to overhaul the target in the match that went right down the wire.